The number one request I get on my blog is to share MORE teacher stuff. I'm often hesitant to do that because I'm afraid that 90% of y'all will find it extremely boring, but I'm going to go for it more often and see how it goes :) I'm actually NOT at work today and as I was getting everything ready for my sub yesterday I decided to snap a few pictures and share how I plan and prepare for not being in the classroom. First of all, I think ALL teachers will agree that being out of the classroom is WAY more work than being in it. Leaving your classes with a substitute is no joke and there's a LOT of prep that goes into it if you want to come back to some semblance of order. - I leave a folder for each of my classes that contains their assignment for the day, any makeup work that needs to be passed out to kids that have been absent, graded work that needs to get returned to students and their assignment for the day. - I make a "cover sheet" for each folder that has the class period, times the class meets, directions for the day and a class roster for attendance. - I make my directions REALLY detailed. Like, "please ask Student So and So to return the papers labeled "to return" to their classmates" and "please collect last night's homework and while students are working put it in alphabetical order to make sure you got a paper from all students". I never used to do this because I felt SUPER BOSSY, but after talking to several subs they told me that they really appreciated the detailed instruction and it makes things SO MUCH EASIER for me when I get back. - I put the exact number of papers needed for each class in each folder. If a student is absent I ask that the sub write their name on the blank assignment so that when I get back and open the folder I know exactly who wasn't there and their assignment is waiting and ready for them. - I make sure that whatever assignment I leave is review and not new material. I mix critical thinking and application problems in with the majority procedural type problems because I remember my own frustration as a student when you'd have a sub and your assignment seemed like it had been pulled from left field. I want the kids to get in extra practice and/or application without feeling frustrated. 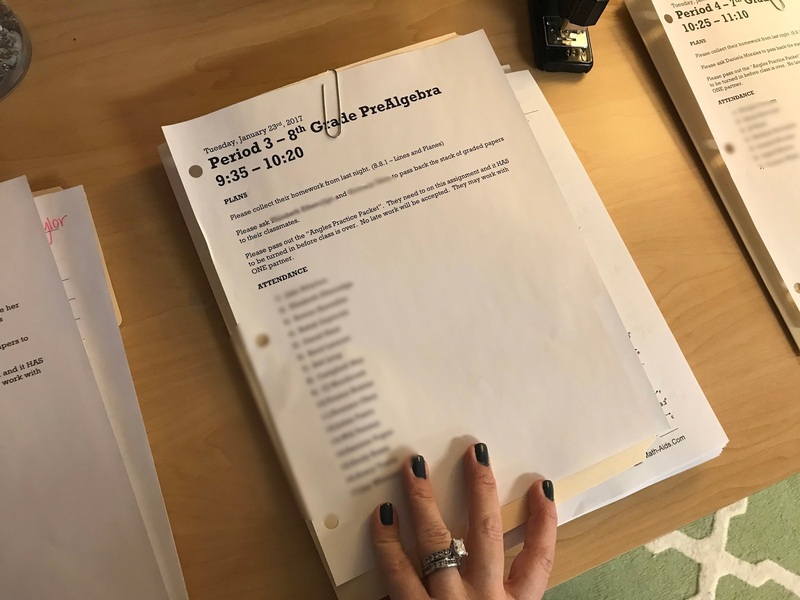 - The folder method works beautifully for me because when I get back to my classroom after being gone I have a stack of folders with attendance rosters ready for me to input, completed assignments already in alphabetical order ready to be graded and any behavior issues noted for parent communication. - I make sure I prep everything I'll need for the day I come back as well - so that way I'm ready to go when I get back in the classroom and don't have to come up in the evening. I leave everything out in order on my desk and always handwrite a thank you note with my cell phone number on it in case the sub has any questions. My list was extra long yesterday because my Math 7 classes are taking a test when I get back on Wednesday and so I had to prep a few extra study materials and answer keys for them to have. You can see more of my teacher planner and how I stay organized on a daily/weekly basis HERE. So let's get real - I spent several hours yesterday getting everything prepped, organized and ready to be out for a day. This was a day I planned on taking and so I was able to prepare in a more "ideal" kind of scenario. We all know that that isn't always the case when you need a sub. Sometimes it's the morning that you're supposed to be doing this awesome hands-on lesson and your kid pukes in the car on the way to school. Or it's 3 am and you're emailing the secretary a worksheet you bought off teachers-pay-teachers because you woke up to go to the bathroom and found out you have pink eye. Or your husband is calling in for you saying, "I'm so sorry - but she's running a 103 degree temperature and she woke up to email you but then fell back asleep" (this was where I was back in October - blah!). If you have any questions or have other "Teacher Topics" you want me to talk about let me know in the comments! I'd also love to hear any best practices y'all have for being out of the classroom. You forgot to mention the worst sub-planning situation of all-maternity leave, ha! Oh, girl. I've done it three times - so so so stressful!!! Believe it or not I pretty much did plans like this for 2 months worth of classes. I have no doubts you’re a substitutes’ dream!! Yes!! Having a sub is so much more work that a few times I've been guilty of just going to school sick haha! Like you, I always make sure it's review material and make it due at the end of class. I also assign more work than what is needed because I don't want there to be any down time. Not only are you having to meticulously plan for the day you're going to be absent, but you also have to do the same thing for your next day back. I think we've all done that! And AMEN to more work than needed! I was JUST going to say this! LOL It is often much easier to drag yourself in and just do it yourself. Hopefully, you decide to stay home when you're really sick though-- taking into consideration students with compromised immune systems or chronic illnesses who might be in your class. Of course! Going in when you're miserable with a sinus infection is a different story than going in with something contagious (which I don't think any teacher would do). My sub planning looks very similar. I also leave extremely detailed plans (have so and so hand out the papers, kids should be reading along in their books while you read aloud to them, etc.). I've also had subs thank me for such detailed plans. I keep a template for sub plans on my computer so I can just change the date, but the schedule of the day is already there. I just need to fill in what to do for each subject (I teach elem. so all the subjects). You're totally right - it's easier to go to work than to leave plans! I was a substitute teacher for many years (both long term subs and day to day subs) and I LOVED detailed plans. I had enough experience under my belt that I could get thrown into any classroom at any minute and manage to get us through the day but the teachers who had great lesson plans made my day so much easier! YAY!!!! So glad y'all enjoyed! I love when you talk about teacher planning! It’s so fun to read about that side of you! This is a great help to your subs. I was a sub last fall and it was a night and day situation when you had a teacher leave plans for you. This is so well thought out and organized. Enjoy your day! I agree with Shay! I'm not a teacher either but it's still interesting! I love how organized you are! I'm sure your subs love you. How do you keep from getting burnt out? Seems like most of the teachers feel so exhausted and/or under appreciated? Do you have advice for subs? I might try it next year. Amazing! Now I wouldn't have noticed this, if I hadn't just made the same mistake myself. You still have the year as 2017 on the sheets. I am a regular sub at my girls school and I so appreciate the teachers leaving very organized, detailed information for me. I have a lot of experience and can get by but I would much rather keep the class doing what they were supposed to do. I also want the teacher to come back to as little extra work as possible because I know what effort it takes. Also, I have a 7th grader in pre algebra and she struggles some and was wondering if you had any advice of things that we can do to help at home. We already did somethings like previewing the lessons and reviewing the lessons, extra practice,but would live any tips you might have. Many blessings on your day! I'm not a teacher but at one point in my life I thought I could be one, until I taught Sunday school to junior high kids and found out that it wasn't for me. Let's say a stink bomb incident really deterred me from pursuing a teaching career, lol. All of this to say that I'm really interested in these posts, I know how hard teachers work but it's interesting to see all the details! Thanks Andrea! I love to see what other teachers leave for plans. I am a media specialist so mine are a little different, but it is still leaving plans for how to run the center for the day. I love your Teacher Tuesday posts! Would you ever think of doing a link up for them? Happy Tuesday! As a homeschool mom, I love this glimpse into a classroom and all the preparation that goes into your teaching. And, I would also love it if you could teach my boys math:). Enjoy your day off, Andrea:). As a sub, this is the dream!! I would love if all teachers would leave plans like this!! I'm not a teacher, but I find these posts interesting! I love your organization! This is wonderful!! Love the folder idea. I would love for you to discuss Google Classroom in the future. I use it, but I don't think I am using it to its full potential. Thank you!! I try SO hard not to insult my sub's intelligence, but I also know that I hated feeling clueless when I subbed. Nothing is worse than being at the mercy of Middle Schoolers! I am a 5th grade teacher, so I teach Reading, Math, Writing, Science/SS - plus centers rotations - every day. I wish people knew that it takes me 4 plus hours to get ready to be out! Trust me, if I can avoid writing sub plans, I will! I leave super detailed plans for a sub and always always get thanked for it later! I was in the classroom for five years and I would leave the most detailed lesson plans for subs. Unfortunately, I worked at a school with a lot of behavioral issues so the work never got done. I always came back to some interesting notes and a few subs refused to step foot in the school again haha. I’m a literacy coach now and don’t require a substitute when I’m out and it’s been magical. I remember the time and work I would put into those! I love how organized you are with the folders. I couldn’t imagine making plans for more than two classes! Thank you for sharing! I am a middle school sub and your sub plans are a dream!!! I wish all teachers that plan to be out were as organized as you are. The other thing I appreciate is enough work to keep the students busy most of the class period. Thank you for sharing!! You are so organized!!! I always think getting a babysitter is similar to getting a sub...it’s a lot of work to prep for a sitter with young kids....meal prep, bedtime routine, straighten house, type up details, etc. lol! Sometimes it seems easier to just stay at home! But you seem like an awesome teacher to sub for!! I'm not a teacher, but my girls HAVE teachers and I love insight into their world, so these posts are great! I hate making sub plans more than almost anything on earth. I'm over here trying to prep for maternity leave, and it is straight misery. I'm a classroom control freak so sub plans are so hard for me! I'm a full time sub at my kid's (elementary) school, and your plans are my favorite kind! The more detailed, the better! My first day ever subbing was almost my last, since the 'plans' were a piece of torn out notebook paper with short hand written directions for the day (not detailed at all, and not enough to fill our day!) and a stack of worksheets to hand out. None of them were in order with the notes written, and I had to sort it all out and try to make it all last the entire day - beyond stressful, and I had a class of 7 year olds constantly telling me, "That's not how we do this! ", etc...I kept at it, though, and most teachers thankfully leave at least semi-detailed notes which is much more helpful. And the ones who leave plans like yours are my favorite. I always thank them for it! Always love your teacher posts! :) Thanks for sharing! I definitely need to incorporate the emergency binder! I'm not a teacher but I love these posts! My Mom was a teacher for 30 years and, like you, was very organized. I ended up in the finance industry but I spent many hours in her classroom pretending to be a teacher! Yay! More teacher posts! I, also, make super detailed plans that sometimes I wonder if I sound like I'm being bossy because I use student names and write out what the sub should say and write on the whiteboard because I want to make sure everything goes smoothly for them! I'm interested in a post on how you do all of your grading with a family and 3 kids?! Do you grade everything, do you use online grading tools, do you trade and grade, etc.? 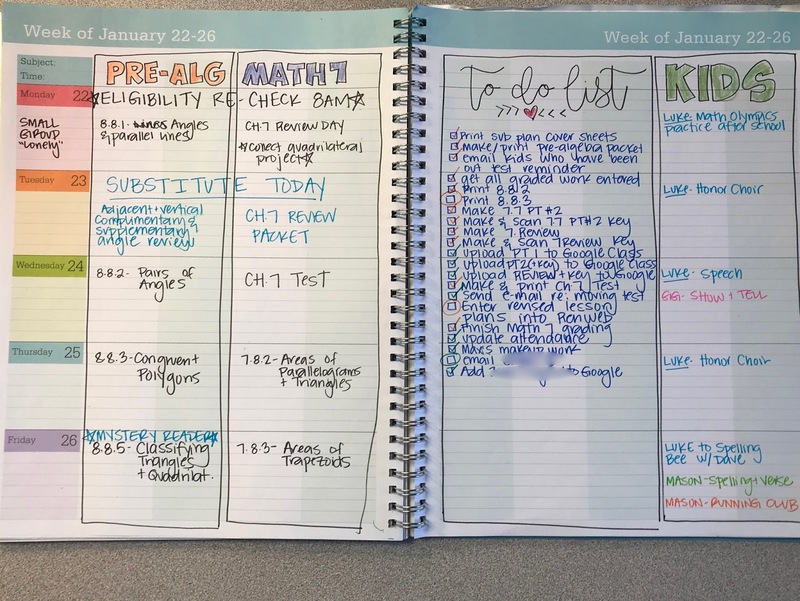 Thanks for sharing -- love how colorful and decorated your planner is! Love this so much! I am a teacher and love your tips. 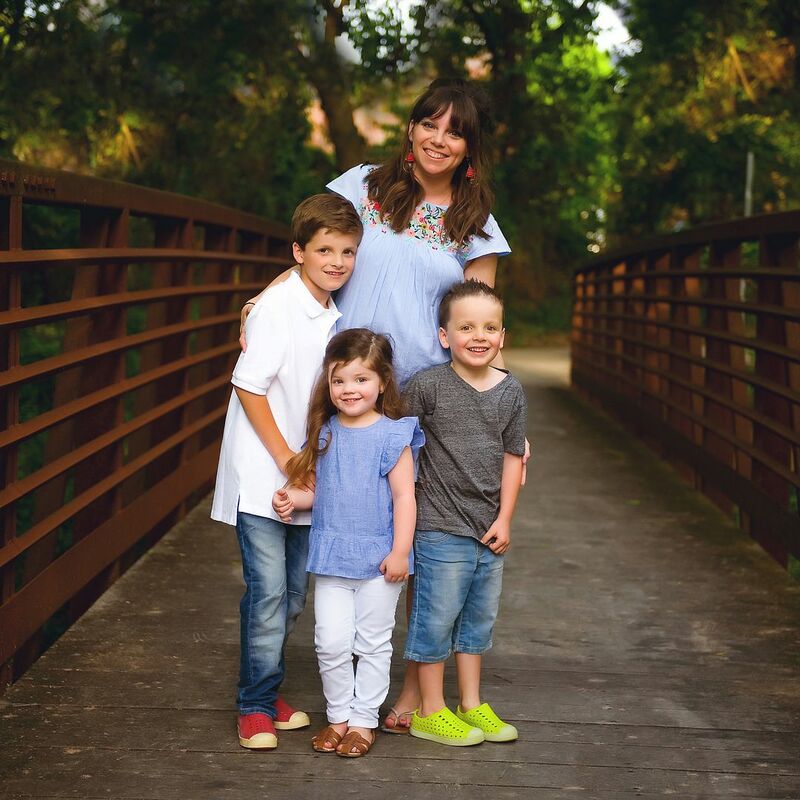 You are one great teacher and mom! Way to rock both!! I used to teach and loved it and too was super organized. Now I seem like it's so much work to just take care of my 3 :))) But I love it. Where is your key fob from? I love that you have a matching lanyard! !